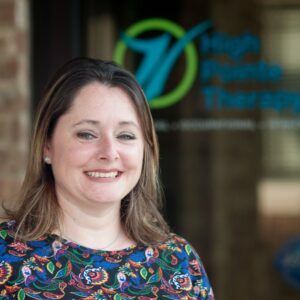 Patient Intake Coordinator ~ Nicole joined High Pointe in November of 2017 after being a stay at home mom for almost 10 years. She and her husband Ryan, who is a Medical Service Officer in the Army have four children, Owen, Isabelle, Liam and Olivia. They have a menagerie of pets and once her husband retires they’d love to start a hobby farm. Nicole’s responsibilites include taking referrals, scheduling pediatric clients, and helping kiddos get the best care possible. Nicole is originally from New England, but has called Clarksville home for the past 20 years. She also helped establish Cub Scout Pack 506 and has served as her son’s Den leader. In her spare time she enjoys kayaking, camping, gardening and checking out new places with her family.